How should a company formulate a sound supply chain strategy? In the past, supply chain professionals make use of various tools and techniques of general business management such as Balanced Scorecard, Blue Ocean Strategy, SWOT Analysis and so on to do the job. The good news is, the new generation of strategy formulation technique dedicated to supply chain management is now available! The purpose of this article is to introduce you to the book "Supply Chain Transformation: Building and Executing an Integrated Supply Chain Strategy" and explain how it can help you to create sustainable supply chain excellence. J. Paul Dittmann is the Executive Director of the Global Supply Chain Institute at the University of Tennessee. Before that, he worked in various senior management positions at the Whirlpool Corporation. He is also one of the supply chains thought leaders, according to a study by SupplyChainOpz. According to a survey conducted by the author and his team at UTK, only a handful of respondents had a well-documented supply chain strategy. What is a supply chain strategy actually? Do you consider "achieving a 98 percent service level" a kind of strategy? The first chapter deals with the foundation of the book. The author explains in a clear and concise manner about the characteristics of solid supply chain strategy, why it matters to all of us and how to convince top management to start a supply chain strategy project. Chapter 2: it goes without saying that a good strategy should start with customers. But who is the customer and how far down the chain you should go? The author has provided a list of questions that you can use to quickly reveal customer's needs and the trends that can influence the future needs. Chapter 3: an internal supply chain assessment can be done in-house or by the outside consultants. Anyway, the author shows you in great detail how you can identify the scope of assessment, the sources of secondary data you need, how to conduct an interview, an example of SWOT Analysis, Five Pillar Analysis and the list of interview questions at the end of the chapter. Chapter 4: in order to increase the level of supply chain capabilities, emerging trends in supply chain management is very important. You will learn about 7 mega-trends and how it applies to your industry. Chapter 5: many companies analyze the competition by benchmarking certain KPIs against peers, this is definitely too simple. To capture the competitor's movement, the author identifies both sources of publicly available data and a way to find hard-to-obtain data. Chapter 6: yes, technology is an integral part of modern supply chain management. But, what kind of technology you should pursue? The author breaks down some issues of supply chain technology and provides a list of questions you should ask yourself before acquiring or implementing a certain technology. Chapter 7: here you will find the most simple yet effective supply chain risk analysis and mitigation that you can use. Chapter 8: page 147 will show you how the raw data from chapter 2-7 is put together. The author also illustrates 3 ways to prioritize the project. 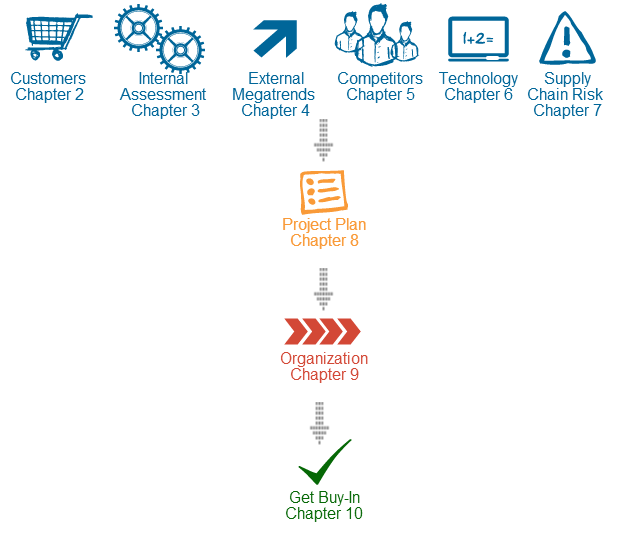 Chapter 9: since a new project requires the need for a new supply chain organization, the author suggests the ways to handle organizations structure, reporting route and necessary metrics that foster the success of a project. Chapter 10: this is where your hard work becomes the reality. Pro tips are provided to you so you can overcome the resistance to change and workplace politics. The journey ends with the real-life case study in chapter 11. In my opinion, the contents flow smoothly, straight to the point and it's filled with fresh and unique perspectives. At the end of each chapter, the "Action Steps" encourages you to think deeply and apply what you learn to your situation. No matter who you are, executives who seek to excel in the supply chain strategy, undergrad/grad students who want to apply theories to a supply chain project or consultants who want to see new angles, this book is definitely for you. It's like the voice-guided, turn-by-turn navigation system that helps you to overcome obstacles in every step of the way.